Sci-fi fans and others have tried before to recreate the Enterprise-D starship from “Star Trek: The Next Generation” in virtual reality. Although some of these VR experiences have been impressive, another one has just arrived on the scene that stands far above the rest, say some VR enthusiasts. 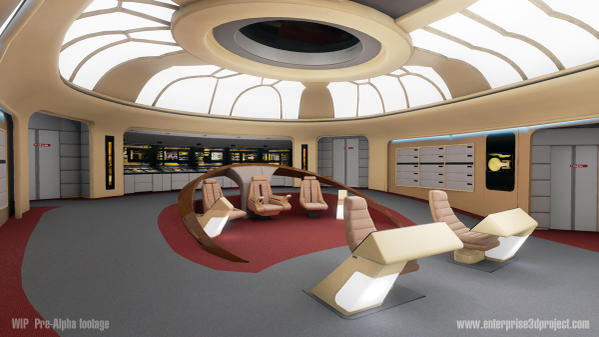 The Enterprise Construction Project is spearheaded by a 3D artist identified only as Jason, whose obsession is to create a VR version of the entirety of the USS Enterprise NCC-1701-D and all its 42 decks. According to Road to VR, Jason has rendered his work thus far via Unreal Engine 4, with an attention to detail that has been unparalleled by other efforts. But this Enterprise-D, “unquestionably the most comprehensive of its kind” poses questions for fans and the franchise. However, as the Enterprise-D becomes more detailed and realistic, so do the odds that CBS will put a stop to the venture or, at least, want royalties, notes Road to VR. What’s a trekkie to do? If the fanbase has an interest, says Jason, he will try to pursue it, but it will required crowdsourced funds to hire developers and artists. With regard to licensing, Jason says he plans to “seek CBS’ blessing to continue to create this. But to release it as a product, licensing will have to be procured.” All this requires more people to be hired, and the costs add up. Road to VR calls on all “Star Trek” fans to go to the project’s Facebook page to show support, follow the project on Twitter, stay alert to a potential Kickstarter campaign and Patreon scheme, and “pray to Worf” that Jason prevails.